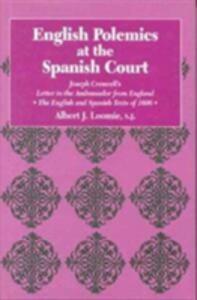 In 1606 when the Spanish court learned about the recent Draconian laws against the Catholics in England in the aftermath of the notorious Gunpowder Plot, Joseph Creswell, a well-known Jesuit living in Madrid, wrote a public letter to Sir Charles Cornwallis, the ambassador of James I. His carefully reasoned tract argued that violence against the consciences of Englishmen and women was no longer in place after the peace treaty arranged between the two hostile Catholic and Protestant kingdoms was signed. To rally support among influential leaders in the court capital of the Spanish king, he printed a Castilian translation of the "letter" for simultaneous circulation. Readers have, for the first time, an annotated edition of both Creswell's English text, based on the original copy presented to the ambassador (now located at the British Library) and his contemporary Castilian version from the unique copy in the Biblioteca Nacional in Madrid. In this book, historians, political philosophers, and scholars of Jacobean prose and polemics will find a new author added to the library of English recusant literature of the early seventeenth century. Joseph Creswell drew upon his considerable personal knowledge to write the earliest printed contemporary comments about the events in the aftermath of the Gunpowder Plot. Hereto known only as a close associate of more famous writers of the counter Reformation, such as Robert Persons or Pedro de Ribadeneyra, Joseph Creswell can now be seen as an original and lively polemicist seizing an opportunity to address both an English and Spanish audience.